Indonesia is beginning to look into unconventional gas plays. Mary Ching explains how new entrants such as Lion Energy are exploring the country’s basins. 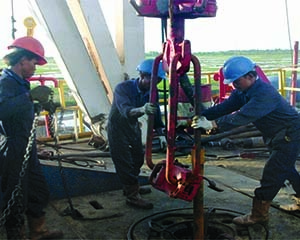 Pertamina drilling activities in Indonesia. Indonesia is facing increasing decline of traditionally produced gas that is easy to access, causing the country to turn to gas resources trapped tightly underground in low-permeability rocks such as coal and shale. In the past, this gas was considered too costly or even not practical to access. Today, technological sophistication has warranted development and production of unconventional gas reservoirs that include shale gas (derived from shale deposits), coal bed methane or CBM (extracted from coal beds), and tight gas from reservoirs trapped underground in other low- permeability rock formations. Tight gas is produced from sandstones and carbonates, shales and coal seams. Tight gas reservoirs do not produce naturally at economic flow rates. Nor do they recover economic volumes of natural gas unless the rock is stimulated using hydraulic fracturing or another production enhancing technique is used, such as drilling horizontal or multilateral wellbores. These can increase the recovery efficiency in the reservoir. In the United States, tight gas was first produced in the 1970s, while coalbed methane was first produced more than two decades ago. Shale gas production in the United States began more recently. Development and production of gas from tight reservoirs spread throughout the world during the 1990s. Lately, Canada, Australia, Mexico, Venezuela, Argentina, Indonesia, China, Russia, Egypt, and Saudi Arabia have successfully produced tight gas. Even though unconventional gas has been around for many years, it was not widespread. It has spread because of a renaissance of hydraulic fracturing for unconventional gas. High gas prices in the early 2000’s also propelled drillers to develop unconventional gas resources. in unconventional plays in other countries, especially from gas importing countries. To be able to tap local, unconventional gas resources brings greater energy security; costly gas imports can be decreased and gas may even be exported. Indonesia is the only nation in Asia, apart from China, Australia and India, that envisions pursuing tight gas and other unconventional resources. This comes after the government promoted CBM and shale gas exploration and development in Indonesia. Estimates of the country potential unconventional gas reserves range from 1500 tcf to 2500 tcf of tight sand, CBM, and shale. According to the Ministry of Energy and Mineral Resources Indonesia, the country has 453 tcf of CBM reserves, and expects production to reach 183 bcf/yr by 2020. The government began awarding CBM blocks in the South Sumatra and Central Sumatra basins, and the Kutei and Barito basins in East Kalimantan in 2007. Last year, Dart Energy (Singapore) and Indonesian PT Energi Pasir Hitam initiated CBM exploration activities in East Kalimantan in order to supply power plants and the Bontang LNG facility. During the second quarter of 2012, Indonesia started four shale gas study projects which are anticipated to produce commercial shale gas by 2018. In December 2013, the government awarded two shale gas production sharing agreements (PSC) to Pertamina for the Sumbagut block in North Sumatra. The Sumbagut block has an estimated 19 tcf of potential shale gas resources. US Energy Information Administration (EIA) stated that Indonesia has 46 tcf of recoverable shale gas resources. Tight gas prospects are found in the North and South Sumatra, East Kalimantan, and Java. The Indonesian government is committed to fostering a commercially attractive environment for businesses. In order to support national growth in gas production and to fill supply and demand gap, seismic surveys and exploration are promoted and opportunities are open to foreign companies to develop this potential. The first stage of unconventional development involves very high costs. To counter this, the government introduced new regulations to encourage exploration, development and investments. The country is also expected to offer attractive fiscal terms specifically laid out for unconventional resources and production. In 2012, the government stated “non-conventional oil and natural gas... shall be defined as oil and natural gas that is exploited using fracking technology from the reservoir where oil and natural gas with low permeability is formed.” At present, the fiscal terms are being reviewed and there are more than 70 Joint Study Applications. It is anticipated that the gas and oil profit shares for contractors to be 45% (based on the current CBM terms) and 40%, respectively. Lion Energy Ltd. (Lion) is an illustration of a foreign company’s presence in Indonesia to tap into the unconventional business. Lion’s major shareholders are Risco Energy Investments (55.3%), Tower Energy (6.1%), and Management (13.3%). Apart from shale gas and shale oil, Lion is venturing into tight gas and tight oil in the Sumatra basins. Augmented by two Indonesian conventional PSCs, Lion is entering the Indonesian unconventional industry with completion of a concurrent series of transactions to reposition the company under a new portfolio in Indonesia. The company’s new portfolio include a 2.5% interest in the producing Seram PSC; 35% equity in the South Block A PSC exploration in the North Sumatra Basin; and, four Unconventional Joint Study applications for an area more than 17,000sq km in Sumatra. Lion is a pioneer among smaller exploration companies in Indonesia. The fact that Indonesian has the fourth largest population in the world with almost 250 million people and an escalating gas demand rate of more than 5%/year have propelled Lion’s presence in the country. Other factors that contributed to Lion’s interest in Indonesia include its steady economic progress of 6% GDP growth/year, declining production from aging conventional oil and gas fields in Sumatra, and rising domestic gas prices. In 2012, Indonesia was reported to have consumed 1329 bcf of natural gas. Some sources predict that the Sumatra and Java regions in Indonesia will experience a large deficit in gas supply in the future. Planned by the Ministry of Energy and Mineral Resources, the National Energy Mix Target in 2025 entails the increased use of natural gas from 21% to 30% of total energy use. The Lion Joint Study Areas have demonstrated that Indonesia ‘contains significant potential with key target intervals having positive unconventional characteristics and at suitable maturity over large areas.’ The basins having a range of plays at a variety of maturity windows. The source rocks include organic-rich lacustrine or restricted marine shales, tight finely laminated graben-fill sandstones, tight platform carbonates, condensed organic-rich high stand marine shales/carbonates, and tight finely laminated outer shelf sandstones.